So I went for a job interview today and piled on the makeup and falsies. I haven't been using foundation (except for some super rare occasions when I need to) for months because my skin seems be be cakey and flakey the moment I apply it. That was until... The MUA applied concealer and foundation on me during the MagicColour Bloggers Meetup. I was amazed by how dewy my skin looked despite it flaking on me earlier that morning. Then it hit me.. It's all in the technique. I usually apply foundation by dragging it across my skin or the likes of that. By patting it on with my fingers a little at a time, it gives an entirely different result! Skin's not flaky but dewy instead! Don't apply a thick layer all over. Use thin layers and build it up. It's kinda like stippling with your fingers. Also, use a brightener or opposite colour of your undereyes as a base before concealer. It works wonders and you don't need as much concealer. Products used : Biore UV Perfect Face Milk, Stage Picture Perfect Liquid Camouflage (04), Loreal Liquid Foundation (G3), Etude House Dream On Base (Purple), Too Faced Walk of Shame palette, Empro Triangular Brow Pencil, Empro Day & Night Mascara, Beautilicious The Magic Wand, NYX Rouge Cream Blush (Natural), Mentholatum Lip Pure & NYX Megashine Lipgloss (Smokey Look). i actually prefer applying cream foundations using my hands instead of a brush sometimes. i remember watching fuzkittie's video before on how to have a flawless looking skin,i think & she also used the same method! i sure do hope all the best for the job application,hun! Babe, I've sent you an email! Wonder if you're interested with my offer or not, do get back to me! Well, I've been shortlisted for training but there's some other problem now. My hair's less curly now so it may appear to be much longer. But anyway, my hair memang grows fast lol Just like my nails. I personally prefer smacking on a lot of hydrating skin care then applying oil controlling base or else confirm I'll get oily in an hour. I don't have a corrector (no money ah!) so a brightener will have to do for now..
Isabel,your eyes --- OMG I LOVE IT TO DEATH!! 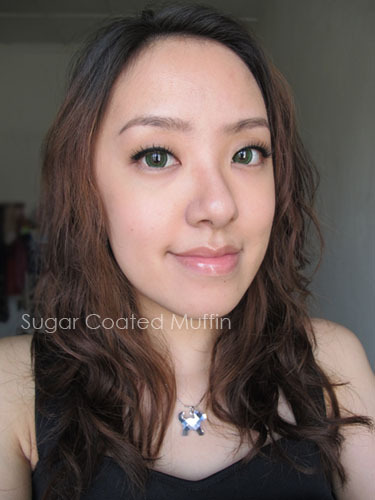 I found colored contact lens can make someone looks a bit scary but on you,it is just,beautiful! Oh yes,did Biore UV Perfect Face Milk really good as primer? 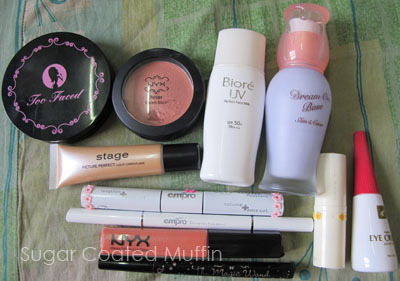 I use bb cream as primer (need to smoothen out my large pore,nice at first but sadly no oil control).Do you have any recommendation? I will work at site (imagine the sun,humid etc,I dont want my make up melt). However, do take note that it contains alcohol and can be drying/irritating on some people. I don't flake from it but I apply a moderate amount, concentrating on oily areas. Also, I moisturize before that.